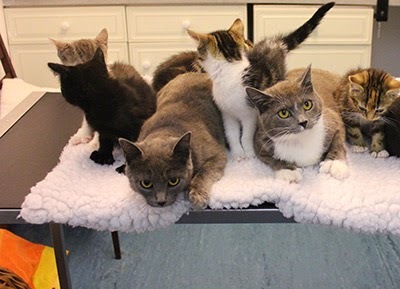 A group of cats was recently abandoned at our Birmingham Adoption Centre. Two female adults were accompanied by six eight-week-old kittens, several of which were showing signs of mild cat flu, plus eye infections. All were seen and treated by a vet and have now been nursed back to health. The extraordinary thing is that with the exception of two kittens, all the cats have extra toes! They have therefore been dubbed ‘the Polydactyl family’. 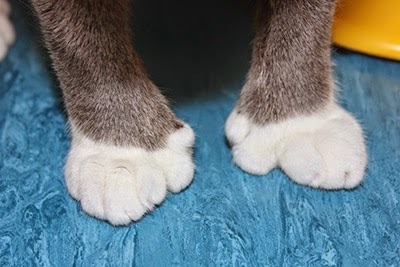 A cat normally has 18 toes (five on each front paw and four on each hind paw), but the number of toes per cat in the Polydactyl family ranges from 22 to 27 – giving the group a total of 180 toes in one pen! The Birmingham Adoption Centre has previously cared for a few polydactyl cats and kittens but has never seen so many at the same time. They really are a spectacular sight. 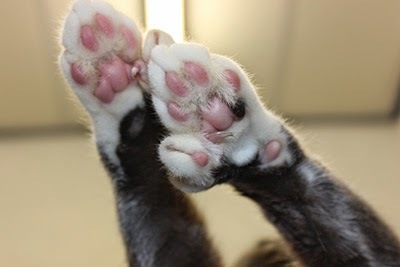 I have cats with extra toes :) They can be a bugger to trim depending on where the toe is but its essential to keep them trimmed as they can grow into the paw!